THIS EVENT HAS BEEN CANCELED DUE TO CAMPUS CLOSURE WITH HOPES TO RESCHEDULE. 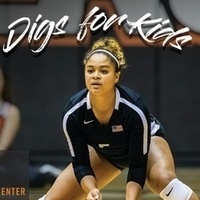 The women's volleyball program has rescheduled its annual "Dig for Kids" event that was orignally slated for Friday, Nov. 16 at the Alex G. Spanos Center. The hazardous air quality has resulted in a campus closure which pushes the event to Dec. 7 from 6:30 p.m. - 7:30 p.m. The free clinic is open for kids of all skill levels from ages 5-12. Stick around after the clinic as all attendees will have a chance to meet the members of the 2018 volleyball team and get an autographed poster as well as be invited to enjoy some ice cream with the group.